Most smartphone companies seem to be pursuing a truly bezel-free screen, and currently the likes of the iPhone X and Essential Phone with their notches are out in front, but Samsung could soon have them beat if it makes use of a new patent. Filed at the WIPO (World Intellectual Property Organization), the patent shows a phone that has a fingerprint scanner, front-facing camera and sensors all embedded in the screen. It uses holes cut into the screen itself for them and means there’s no notch and no bezels, just a screen-filled front. There are obvious benefits to this. It would mean you could fit a big screen in a relatively small body, as well as likely making the phone more aesthetically pleasing. But we’re probably not going to see this in a finished product for a while. Patents don’t always get used for anything anyway and when they do it can take years. Given that Samsung and other companies are gradually shrinking bezels and that in-screen fingerprint scanners are now a thing that exists it’s believable that Samsung would be working on something along these lines, but don’t expect the Samsung Galaxy S9 and Samsung Galaxy S9 Plus to have an all-screen front, as none of the leaks point in that direction. 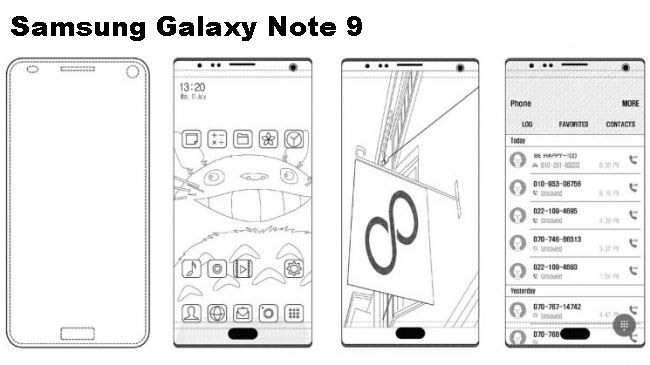 So the earliest we’re likely to see this is the Samsung Galaxy Note 9, and even that might be optimistic.